I used this map of El Stations on Chicago's West side in an article I posted yesterday. Today I'm going to add some more maps and resources you might include in doing your own planning. 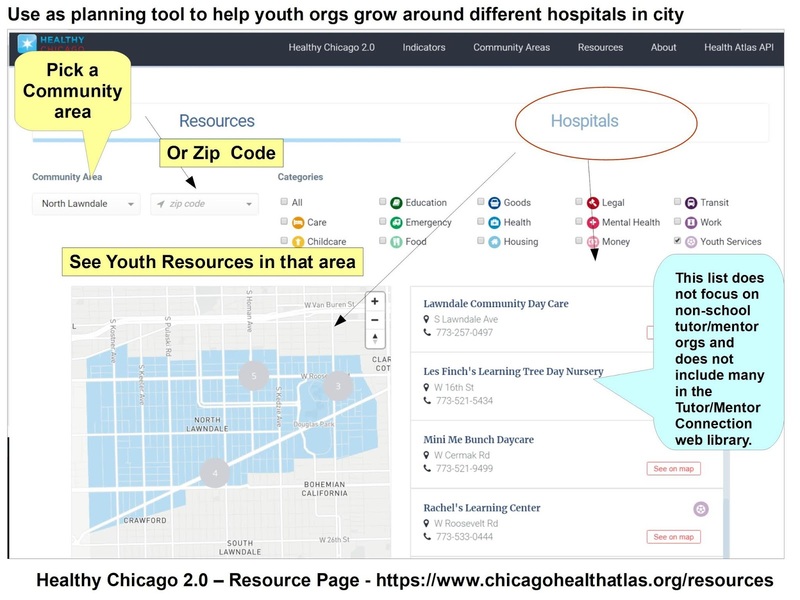 Below are three images that I created from pages on the Healthy Chicago 2.0 Health Atlas web site. These all focus on the North Lawndale area which is included in the map I show above. 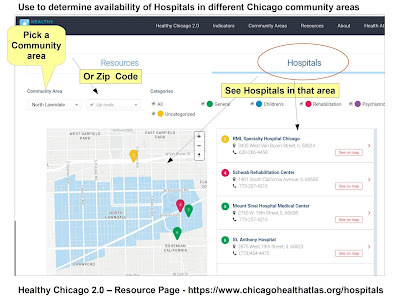 On the RESOURCE page of Healthy Chicago 2.0 you can learn about hospitals available in different community areas or zip codes of Chicago. You can see the page below, showing North Lawndale. 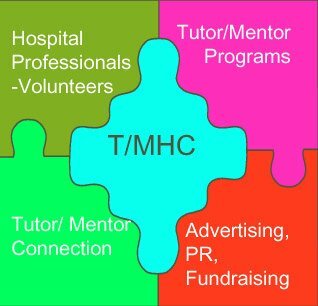 I have written several articles in the past showing roles hospitals, as anchor organizations, could take to help volunteer based tutor, mentor and learning programs grow in the area around the hospital. If a team from any of these hospitals were leading the planning process I have recommended, they'd first create a map showing the area around the hospital. Then they'd want to know what tutor/mentor programs already exist. 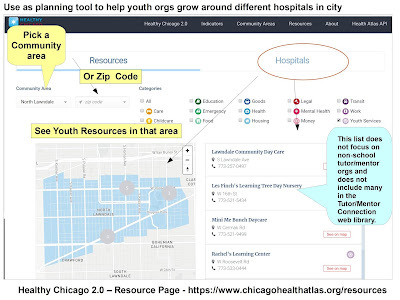 The map below shows YOUTH SERVICES included in the database of Healthy Chicago 2.0. 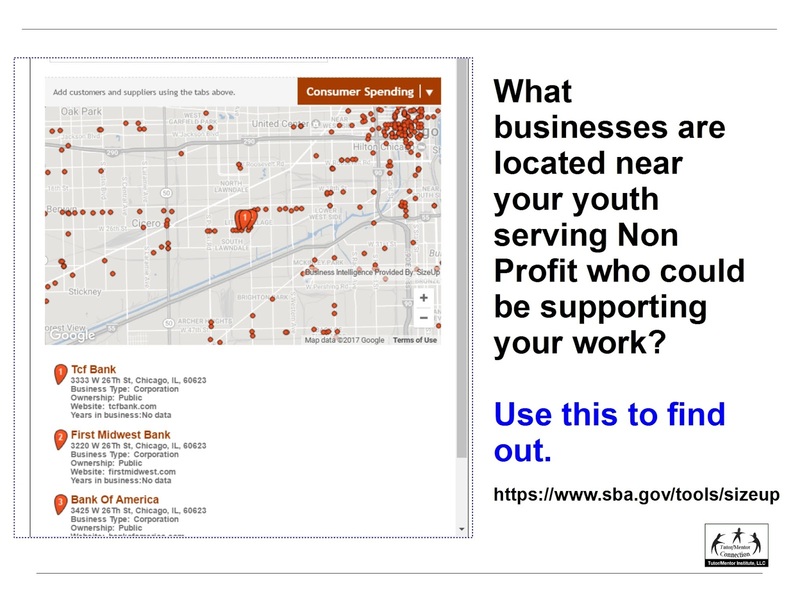 This database does not focus specifically on non-school tutor/mentor programs, and does not include some in the Tutor/Mentor Connection/Institute database, so you'd need to also use the library I point to in this link to create a more focused, comprehensive map. The map at the top of this article was created using this. The area has a very low Child Opportunity Index and a very high economic hardship index with 12,833 young people between age 5 and 24 in the area. 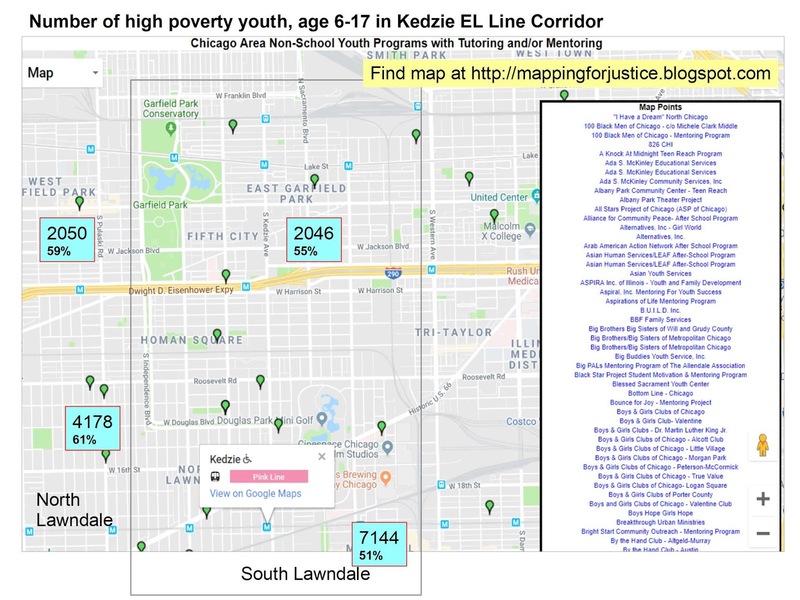 You can supplement this with the information I provide on the map at the top, showing 4100 high poverty kids, age 6-17 in North Lawndale, and 7100 in South Lawndale. If you look at each youth program and ask how many kids they serve, and what age group, you'd find that in total a very small percent of kids in the area have access to organized, on-going, volunteer-based tutor/mentor programs. 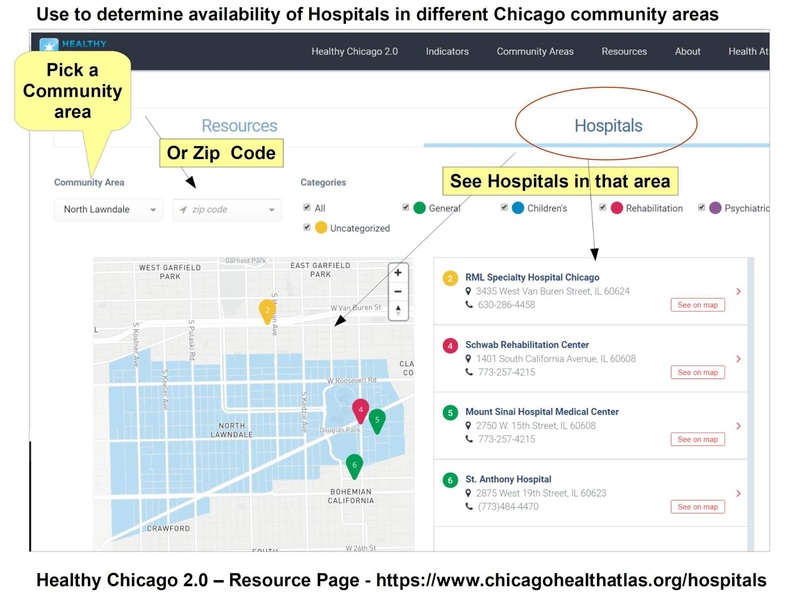 You can find another set of indicator maps on the SCY Chicago web site. I point to it in this article. information and meet to discuss. With this information the hospital can take a role of convener/network-builder, inviting people from the community to gather and look at this information, and begin to talk of ways they can draw more continuous support to help the existing youth programs constantly improve, while also help new programs form, borrowing ideas from existing programs in other parts of Chicago and other parts of the US and the world....all available in sections of the Tutor/Mentor web library that I've been building since 1998. Since the late 90s I've been trying to motivate hospitals and universities to create Tutor/Mentor Connection type planning teams that would do the type of analysis I've just described, and the on-going work that leads to more and better programs helping youth in the service area surrounding a hospital move more safely and successfully through school and into jobs, including jobs in the hospitals themselves. Here's one article with that invitation. Unless a wealthy benefactor steps forward and provides the money to make this happen, I don't think I'll make much progress on this goal since leaders in these institutions are already doing their own things to solve these problems, and that reduces their ability to step back and ask "are there other things we should be doing?" Who else could be helping? I'm not suggesting that a hospital or university spend their own money to build and sustain well-organized non-school tutor/mentor programs. I'm saying they should use their visibility to draw business people into the conversation and motivate them to take this role. 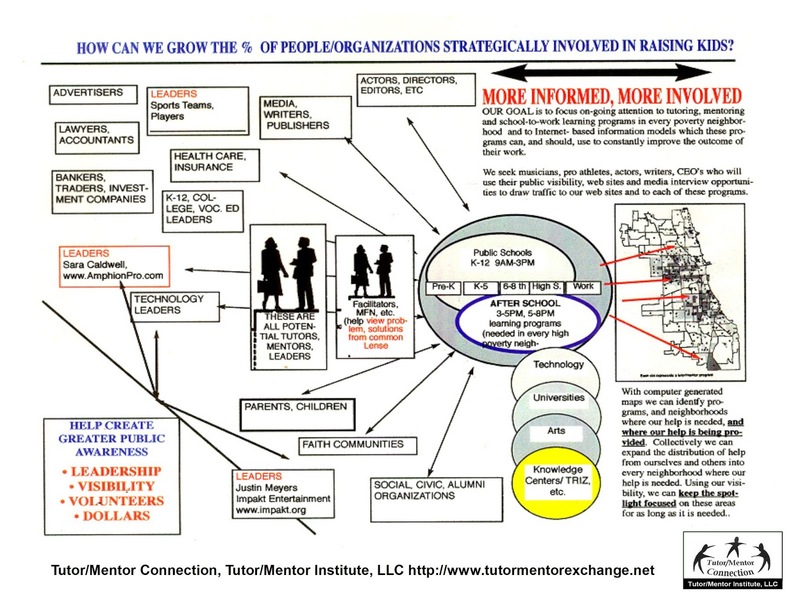 In this section of the Tutor/Mentor Institute, LLC web site if focus on role leaders in business need to take to help pull kids through school and into jobs and careers. At the right is another data platform that a planning team could use. It's a US Small Business Administration Business Locator site, which I describe in this article. Using information like this teams in any neighborhood can build a list of businesses who also share the same geography who should be involved in building and sustaining youth development programs that lower the costs of poverty in the area while increasing the pool of workforce talent and customers. 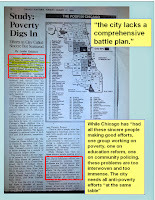 This article and the one from yesterday, as well as others that I've written over and over since 2005, are templates that could be duplicated on web sites of different organizations in various parts of the Chicago region and in other cities....all with the same goal! I'd like to help you develop this strategy. Connect with me on Twitter, Facebook or LinkedIN. If you value the information and ideas I'm sharing, please go to this "fund me" page and make a contribution. 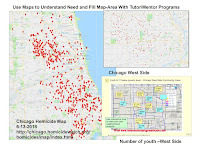 I've been using maps since 1994 to focus attention and resources on all high poverty areas of Chicago where non-school tutor and/or mentor programs are most needed. I embed them in graphics like this to emphasize roles anyone can take to help this happen. While some leaders can use maps to focus on the entire city, I'm trying to help people adopt small sections of the city, such as the North Side, West Side or South Side, or even smaller areas such as a single community area. In this article I'm going to share a series of graphics to illustrate how I do this. First, let's look at the planning cycle. 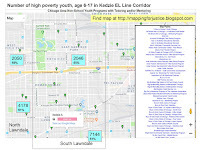 In this concept map I point to a small section of Chicago with the map at the upper left and show information about the number of high poverty kids, age 6-17, who live in the area. 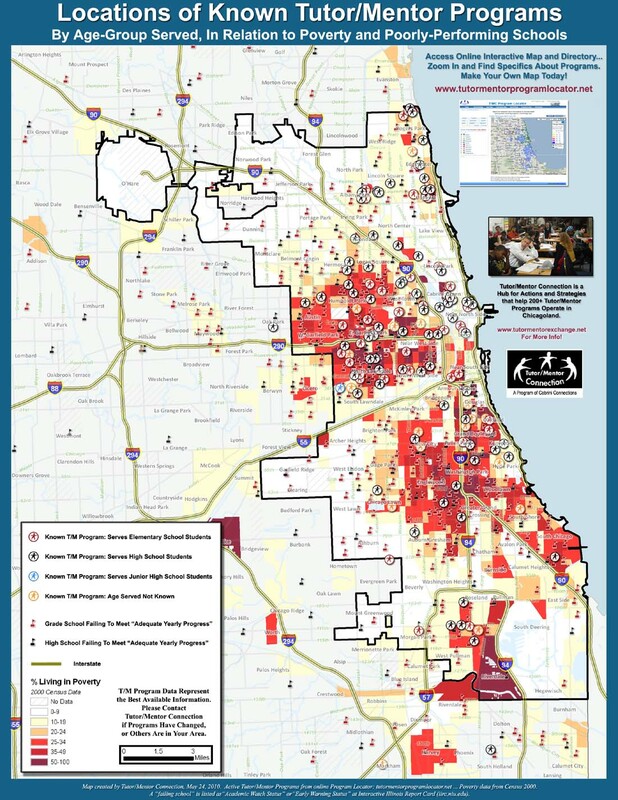 Using other maps and the Tutor/Mentor Chicago Program Links, you can determine what non-school tutor/mentor programs are in the area. The goal is to find ways to support existing programs and help them become great, before launching new programs that do similar work and compete for the same resources. Based on the number of kids in the area who need these programs, most neighborhoods really need more than they have. 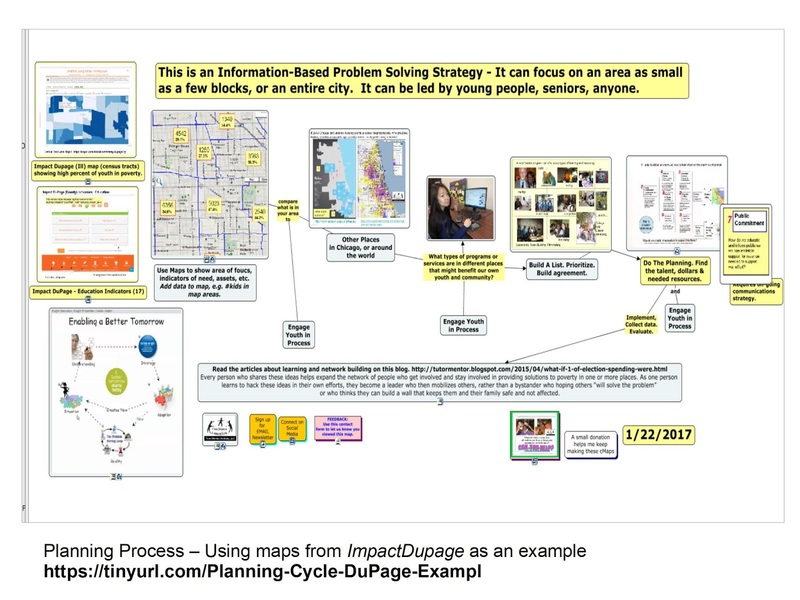 Below is the same planning process map, but I've added two images taken from the IMPACT DUPAGE web site. Just by finding a data resource for DuPage County I was able to create a couple of images that focused the attention of this map on that part of the Chicago region. Below is another example. On Page 7 of the Elevated Chicago Workplan Executive Summary is a map that highlights CTA EL train stations around which they are focusing community development efforts. One focus area is what they call the Kedzie Corridor, where El stops for the Green, Blue and Pink line align vertically with each other on the West side of Chicago. 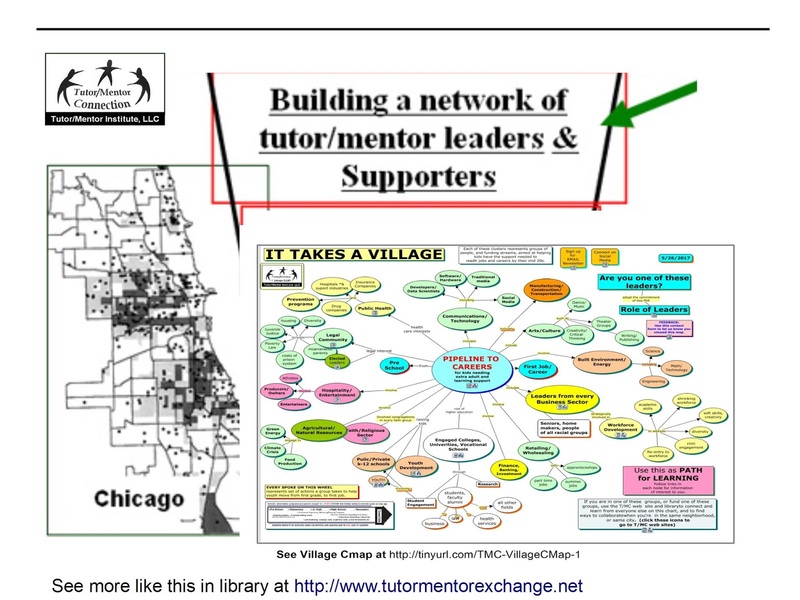 I used my Chicago Tutor/Mentor Programs Map, which you can find here, to create the map view shown above. I enlarged the map to focus on the West side of Chicago, and put my cursor on the Pink Line El Station, to highlight it's location. Green icons on the map are Chicago youth programs. 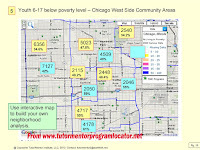 I then looked at the community area maps in this Tutor/Mentor presentation, to get information about the number of high poverty youth in each West side community area, which I added to my map. Then I created a jpg that I could pull into this article, or use in a planning process. Using maps like these leaders in can lead discussions that ask "Is there a need for tutor/mentor programs in this area? Are there programs already here? What do they do? Who do they serve? How many? Do we need more programs in the area? How do we mobilize resources to help existing, or future, programs grow and be the best they can be?" All of these questions should be part of an on-going process, duplicated in many parts of Chicago and other cities throughout the country. If you browse other articles on this blog and on the MappingforJustice blog you'll find many examples of maps created using existing data platforms. Try this idea. Pick any of my articles, and substitute the map-image I use, with a map showing your own city, or a geographic area you want to focus on. In the text, substitute Chicago with the name of your community. Does the article make sense to you? Is it a call for greater involvement that you can use? If yes, go ahead and use my articles as templates for your own. Just share the link with me. Creating maps that focus attention on specific geographic areas that need to be filled with a variety of services and business opportunities is just the first step in this process, but it's one that can support other efforts to draw people from within to map-area together to learn from the data and build new strategies that help existing assets get the on-going resources they need, while also creating new resources to fill areas where there is a need. Without using the maps a long list of services could be generated, yet many of the areas within a map-area would not be covered. This is also work that youth can be learning to do, as part of school-based learning, or as an activity supported by staff and volunteers in non-school programs in different parts of the city. I'd be happy to help you think this process through. Connect with me on Twitter, Facebook or Linkedin, or just introduce yourself with a comment on this article. I've been using a concept map for more than 10 years to visualize all of the different groups of people who need to be involved in helping volunteer-based tutor/mentor programs reach youth in high poverty neighborhoods, and stay connected for many years as those youth move from elementary school, through high school, and college, and into jobs. 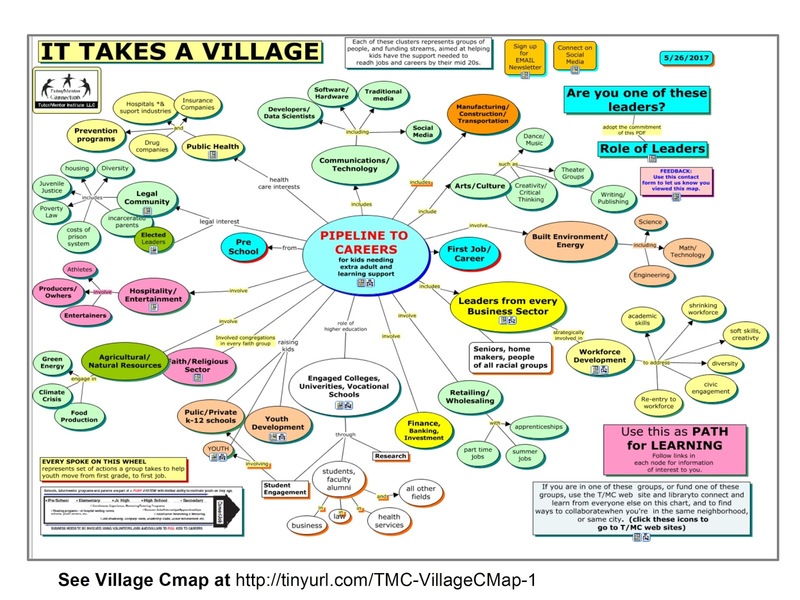 Two University of Michigan grad students did an animated version of this village graphic in the late 2000s, but without a voice-over. Today I was able to record that animation in the video shown below. Last week I posted an article under the headline of "Lessons learned from leading a tutor/mentor program for 35 years". In it I included images showing the tutoring program committee in 1975-76 and in 1990-91, to illustrate the long-term work needed to build and sustain that program. In the video below I talk about my history of involvement and point to the same yearbooks. I shared the "village" video on Twitter today and one of my followers from Florida wrote "Just listened to your YouTube presentation that you twitted out. How can I make a small, $50, contribution to your organization via your PayPal account. You are doing some excellent work." I pointed him to this page and he sent me $50. If you've been reading my articles and value the information I'm sharing, I hope you'll do the same. 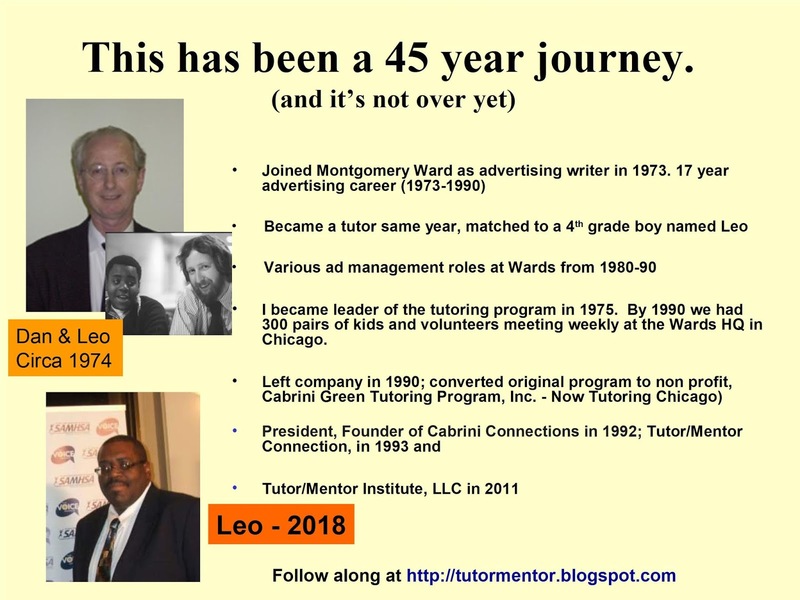 I've been involved with volunteer-based tutor/mentor programs since 1973 when I first connected with Leo Hall, who was in 4th grade at that time. Leo's now over 50 years old and has two sons in college. It's this history that makes me so committed to helping well-organized, mentor-rich programs grow in all high poverty areas of Chicago and in other cities. Every August for the past 40+ years I've used whatever media was available to me in an effort to draw volunteers and donors to the programs I led in Chicago. 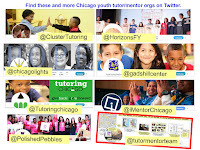 In 1993 I created the Tutor/Mentor Connection (since 2011 the Tutor/Mentor Institute, LLC) to build a master database of Chicago tutor and/or mentor programs and a public awareness campaign that would draw more frequent attention to programs throughout Chicago, and as a result, help each program attract volunteers and donors. Today another former student, Tramaine Montel Ford, shared a video on Facebook, showing what an educator is doing at a school in Brooklyn, NY, to "Disrupt the School to Prison Pipeline". I hope you'll take a look. This could have been me talking about the programs I led, or it could have been the leader of one of many other youth tutor/mentor programs talking about their own efforts to help kids through school. These programs don't exist without a constant flow of support from volunteers and donors. can be found on Twitter. So, please, browse the list of programs I show in my Chicago Programs Link, and pick one, or several, to offer your support. You can also find some of these programs on my Facebook list and in my Twitter list. Some do a much better job than others in telling their story so there's an opportunity for volunteers with communications and web design backgrounds to help them in this area. I recorded a short video to show where this link is on the Tutor/Mentor Connection web site. 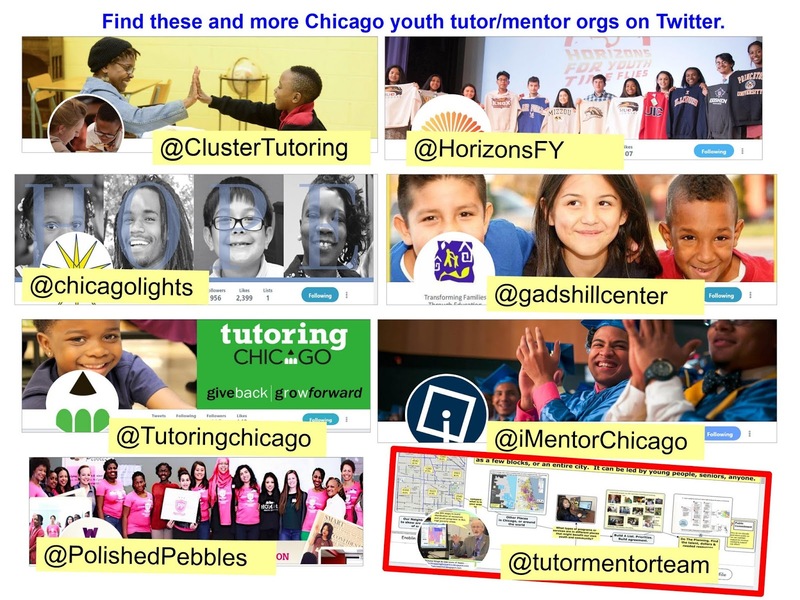 While I'm trying to help youth tutor/mentor programs grow in Chicago and other cities, I need your help if I'm to keep doing this work and keep some of the resources on-line. Please visit this page and support my "go fund me" campaign. When I started leading a volunteer based tutor/mentor program in Chicago in 1975 I held a full-time retail advertising job and the program already had an enrollment of 100 pairs of elementary school age kids and workplace volunteers to begin the school year. With so little time available to lead the program I had to learn to recruit volunteers to help me and delegate roles for them to take. Over time I learned that many volunteers often over-commit, and for various reasons could not complete the project assigned. Often this led to them disappearing from the program instead of asking for help. Thus I learned that I needed to follow up, and help volunteers succeed. The result was that volunteers became more committed to the program and often took greater roles in the future. However, I also learned one more thing. As the leader of the program my vision and commitment was usually greater than that of most volunteers. Because of my constant learning from other programs I often saw opportunities that others did not see. Thus, I had to LEAD. I had to share my visions in ways that volunteers might want to give their time and talent to make those visions a reality. This led to me coining the formula of "R&D+F&L=Success". I applied what I learned as the tutoring program grew from 100 pairs to 440 kids and 550 volunteers by June 1992. Here's a photo showing the leadership committee supporting the 1976-77 program. 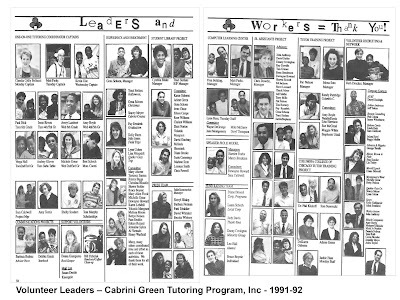 Here's a photo showing the leadership team for the 1991-92 program, which had converted to a non profit structure at the start of the 1990-91 school year. Click on each photo to enlarge. Look at the difference in the number of people involved and the organizational structure between 1976 and 1991-2. Between 1975 and 1981 I had to recruit a new team of leaders ever spring, with just a few carry-overs from the previous year. We had no paid staff until 1979 when we were able to hire a student from Moody Bible Institute for 10-15 hours a week. In 1981 we began to change how the committee was organized and recruit leaders for different functional roles. By this time the program size was nearly 200 and more and more volunteers were coming from companies beyond Montgomery Ward (Partly due to downsizing and closing of the MW catalog business. As volunteers went to different companies they continued to tutor, and often began bringing co-workers). You can see in the second leadership group photos that some volunteers served as formal representatives of the companies they worked at. I used an Excel spreadsheet to record volunteer enrollment and listed the companies they worked at, occupation, and number of years they volunteered. Thus, as I saw groups of five or more from the same company, I began to reach out to veteran volunteers and asked them to become a mentor to co-worker volunteers and a contact point for reaching into the company for donations (we were not a non profit, but still needed food and snack donations, and gifts for the annual Christmas party). This structure took time to develop. It took more than 15 years. The program was already 10 years old when I became it's third leader. At the end of the 1989-90 school year, as we begin creating a non-profit structure, the program already had 300 pairs of kids and volunteers meeting weekly. It still only had a paid staff of three part time college students who worked a total of less than 30 hours a week. Thus it was a 25 year journey to developing this volunteer leadership structure. The R&D+F&L=Success strategy really worked. I created a concept map to visualize this growth. In this section of the Tutor/Mentor Institute, LLC site you can find three PDF essays that share my experiences and can help you start and grow a volunteer based tutor/mentor program in Chicago or elsewhere. While these and all of the resources I share are free, I'm available for a small consulting and/or retainer fee, to help you understand and apply these ideas. I created the Tutor/Mentor Connection in 1993 (and Tutor/Mentor Institute, LLC in 2011) as we were starting a new program to serve 7th to 12th grade youth who aged out of the first program. 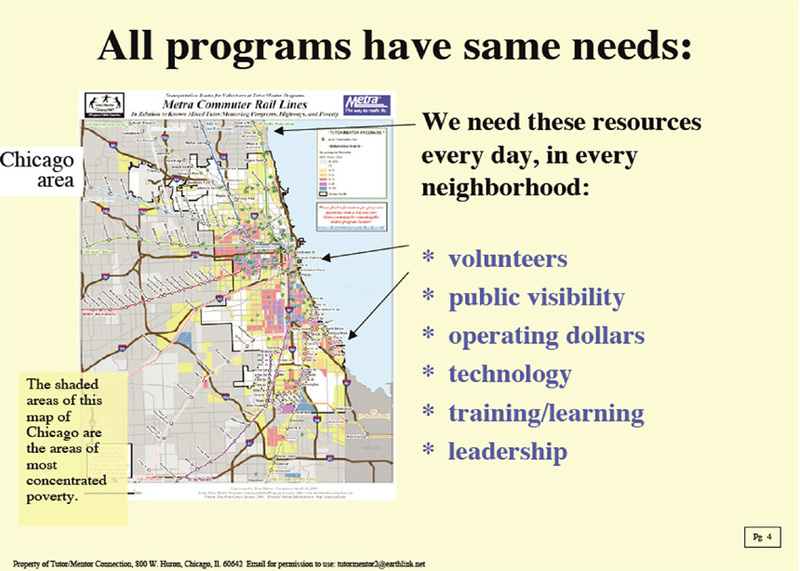 The T/MC's vision was to help high quality programs grow in all poverty areas of Chicago. Thus, my goal is that city and business leaders reach out to me for the experiences and ideas I share, and that they provide funds needed for me to collect, organize and share this information. So far I'm not having a lot of success at this. If you value the experiences and ideas I've been sharing please consider a contribution to help me continue to do this. Use the PayPal button or mailing address on this page. I also recorded a second article, which you can view here. I've added these to a collection of videos that I and interns have created since the late 2000s. I've posted more than 1000 blog articles here and on the MappingforJustice blog since 2005. I think I'll go back through these and record some that I feel are more important than others. My hope is that by my example I'll inspire former students and volunteers and others who are in my network to do their own recordings of my blog articles. At first, you'd just be reading the articles, and commenting from your perspective. As you get comfortable with the ideas I'm sharing, and with creating the recordings, and begin to draw a following, you may want to write and record your own articles. As more people view and understand this information more people will do work needed to make non-school support systems available to more k-12 youth living in high poverty areas. 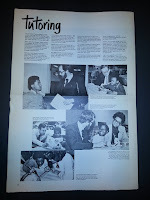 I started volunteering in a tutor/mentor program in Chicago in 1973. That's when I first started meeting weekly with Leo Hall, a 4th grade boy living in Cabrini Green Public Housing, near the Montgomery Ward headquarters where I was starting an advertising career. I became the leader of that program in 1975 and continued through mid 1992. Then I and a few other volunteers formed Cabrini Connections, to help kids who aged out of the first program at the end of 6th grade have similar support as they move from 7th grade through high school. I led that program till mid 2011. 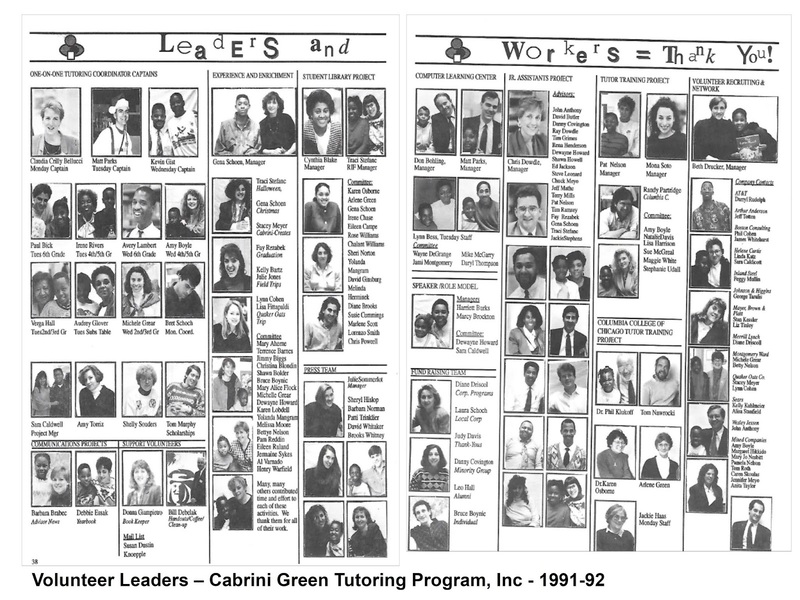 As we created the direct service program in 1993 we also created the Tutor/Mentor Connection to help similar programs grow in all parts of Chicago and to try to increase visibility and the flow of operating dollars to all programs, including the Cabrini Connections program. I still lead that strategy through the Tutor/Mentor Institute, LLC. I try to share my experiences, and those of others, by pointing to a list of program web sites that I've been maintaining since 1993. Today, I got an email from my friend and former tutor, Dan Bassill, about the graduation ceremony going on tonight. 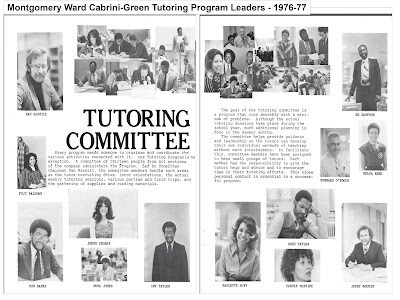 It made me think about when I graduated from MWTP (Montgomery Ward Tutoring Program) or what some of you may call Cabrini Connections. See, I was Dan's first tutee, way back in 197??. It's been that long ago, I honestly cannot remember. But ask Dan about the one kid that changed his life and he will probably mention me (or maybe his daughter and son first, then me). But I digress. As a former tutee and volunteer, I want to say that you all have a great program working on your behalf. When I graduated from the program, it only went to the sixth grade, but you all get to stay until senior year of high school. That is so cool, cause high school can be a very stressful time in your life. I should know, I went to one of the largest high schools in the state, Lane Technical High School. Graduated with 1000 students, so I was basically a number. But the things I learned from Dan and the MWTP really kept my head on straight. See, Dan was at every major event in my life, with the exception of the births of my children. Now, how many people do you know would travel all over the country to see you graduate from college, then come back to see you get married. With gas prices today, I'd only expect a card. Dan has been my mentor and friend for over 30 years and I really respect his opinion on things. I also liked what he has done for the children in Cabrini Green, the children of Chicago, IL. But especially, the children on Cabrini Green. Dan has taken a lot of heat from a lot of people and he kept going. So, you all are the fruits of his labor. After graduating from high school, I went to Memphis State University (Univ. of Memphis) and graduated in 1988, on the Dean's List with a Bachelors degree in Engineering. I now have 2 sons, and am a movie producer and director. A lot of what I do with people is what Dan used to do with me, and that is mentor them. Teach them how to make good decisions and trust and believe in themselves. Presently, I am on the set of my new movie, and I asked Dan to send me some CC products, tee-shirts and stuff, so that my cast can wear them on the set. You never know, you may see CC on the big screen real soon. Well, time to get back on set, but I wanted to say this, keep your head up and never forget where you came from and the people that got you there. Thanks Dan and MWTP for everything that you have done for me. In 2014 Leo invited me to Nashville to celebrate his 50th birthday. He paid all of my expenses! I wrote this article following that. The testimony by Leo is one of several alumni articles posted on the Cabrini Blog. I encourage you to read them. It's these stories, which I have experienced over and over for more than 35 years which drives my passion to help make well organized, non-school, volunteer-based tutor/mentor programs available in more places. If you browse the Chicago Programs list, and this section of programs in other states, you'll find many who also have stories from alumni. I was just looking at this page on the Higher Achievement web site (Washington, Baltimore) with 40 stories. Can these convince you to become strategically involved in helping these programs continue to do good work, while helping new programs start where needed? I've been reaching out to alumni and others to help re-build the Tutor/Mentor Connection and carry it forward into the next decade, with them as leaders and people writing articles like this. While a few have begun to show interest, there still is no new leadership team in place. I've also been asking for financial help to keep me going. Click here to find a page with contributor information. If you'd like to get involved or know more, just introduce yourself with a message in the comment box or connect with me on Twitter, LinkedIN or Facebook. Once again violence in Chicago is front page news and the topic of countless commentary writers. I agree with Rex Huppke's Chicago Tribune column from today that tells politicians to "shut up" unless they have a comprehensive plan. I've been saving news stories about violence, gangs, poverty, poorly performing schools, etc for the past 30 years as part of my own on-going effort to motivate leaders in business, philanthropy, government and the social sector to fill all high poverty areas of the city with comprehensive systems of support that help kids move through school and into jobs. 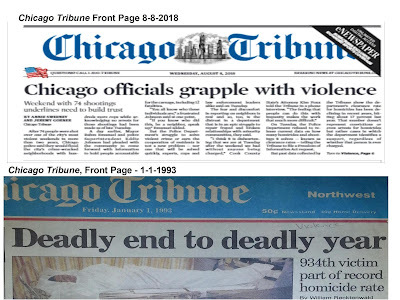 Thus, the headline from yesterday and the front page from January 1, 1993, call attention to the same problem....which was greater then than now, but still too much in 2018. 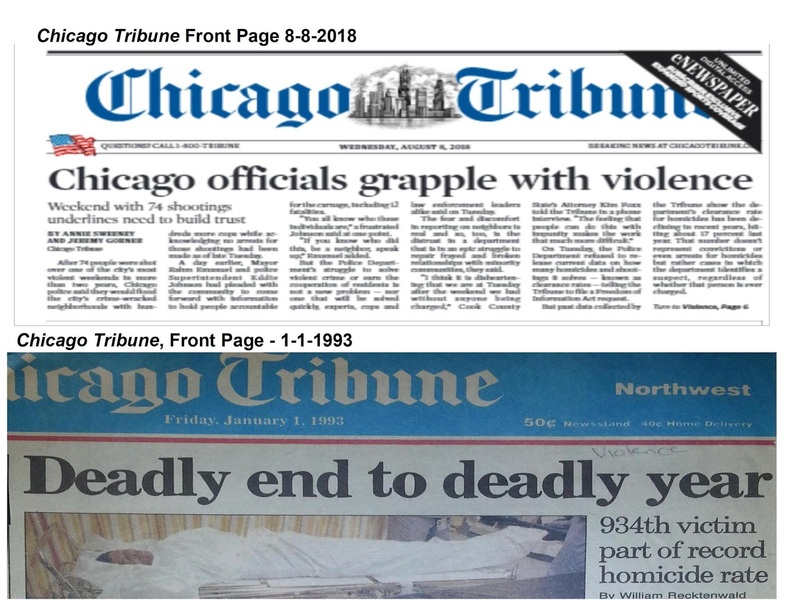 I wrote about this on Sunday and have written about violence in Chicago and long-term strategies that might reduce it often on this blog over the past 13 years, and before that on websites, list serves, email and print newsletters. The politicians aren't the only ones saying "we need to work together". Here's a Tweet that I saw yesterday. At the right is another article from my collection. 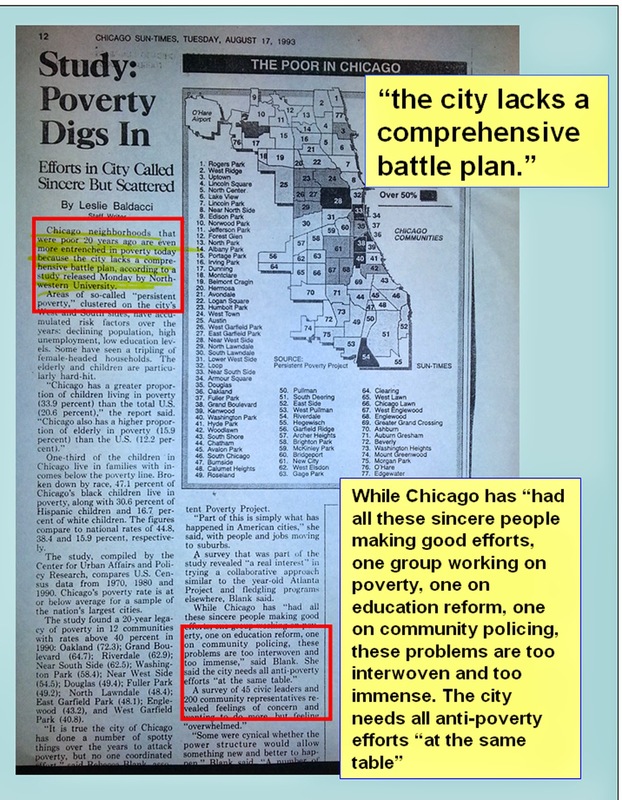 It's a 1993 Chicago SunTimes story which leads off with a statement saying "Chicago neighborhoods that were poor 20 years ago are even more entrenched in poverty today because the city lacks a comprehensive battle plan". I included this article in a 2015 article with the headline of "After the riots, do the planning". 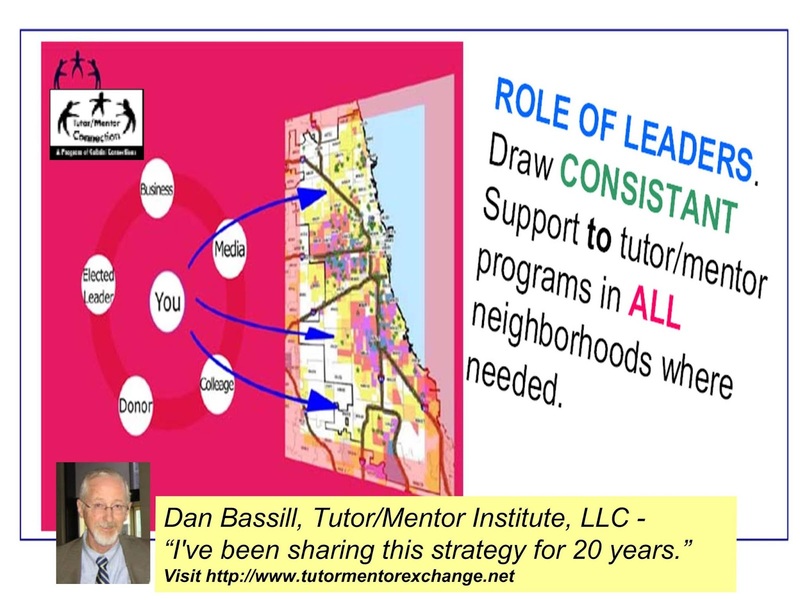 I've been offering a plan since starting the Tutor/Mentor Connection in 1993 (and Tutor/Mentor Institute, LLC in 2011). 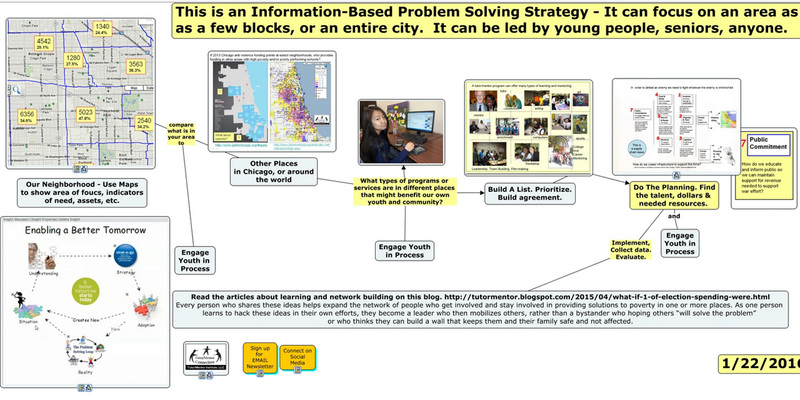 It's visualized in this graphic, and dozens of others, and shows the need to build an information base that anyone can use to support their own efforts to help youth in high poverty areas move safely through school and into adult lives with jobs that enable them to raise their own kids free of poverty. I've been describing this in articles on this blog and on the http://www.tutormentorexchange.net web site for many years. However, far too few people have ever seen these, or spend time digging through past articles and sections of my web library. I keep asking myself, "what if it were the Mayor writing these articles, or issuing them on his web site?" Or, what if LeBron James, Derek Rose, or Oprah were the one writing these articles and calling attention to the ideas in videos, TV shows and music? 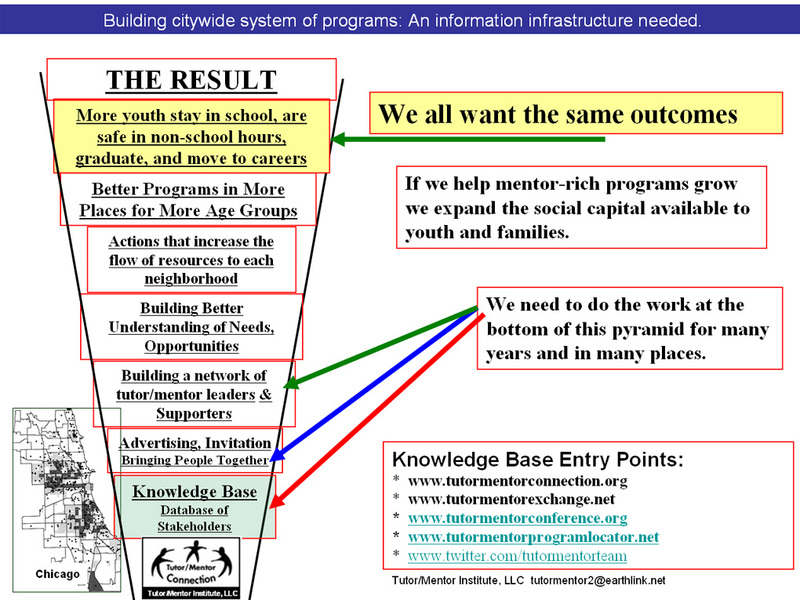 Several years ago I created the animation below to illustrate a role athletes and celebrities could take to support the growth of needed youth tutor,mentor, learning and jobs programs in different neighborhoods. This animation, and other videos in my library, could be re-produced in many ways, with hundreds of different athletes, celebrities, alumni of tutor/mentor programs, etc. giving the message. This video is included several times in a series of articles focused on sports and celebrity stars. Building an information base is just the first step in an on-going four part strategy that I've developed over the past 25 years. Getting people to look at the information, understand it, then apply it to help kids and families in one, or many, high poverty neighborhoods are essential additional steps. While I feel this strategy applies to Chicago, it can also be applied in any other urban area. It can have leaders from many sectors who share the same goals. If you're interested in learning about this, devote time over the next few months to read past articles and browse through sections of my web sites. Or, reach out to me on Twitter, Facebook, Linkedin, or with a comment on this blog and invite me to be part of your planning group. Or, you can visit this page and make a small (or large) contribution to help me keep sharing these ideas and resources. 31 Shot in Chicago - August 5 - What's The Rest of the Story? On my Facebook feed this morning I saw a link to a Chicago Tribune article telling about 31 people being shot since midnight, Sunday morning. Sixteen were teenagers. I did some digging and found this page on the Tribune web site that maps locations of Chicago shootings and keeps it updated regularly. 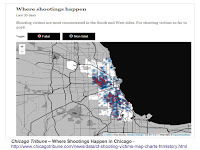 If you view the violence and media tagged articles on this blog you'll see I've been using maps in stories for many years, to focus on where these shootings take place, why, and ways people can get involved in building and sustaining long-term solutions that might reduce some of this. It's my "Rest of the Story" strategy that I first launched in 1993. 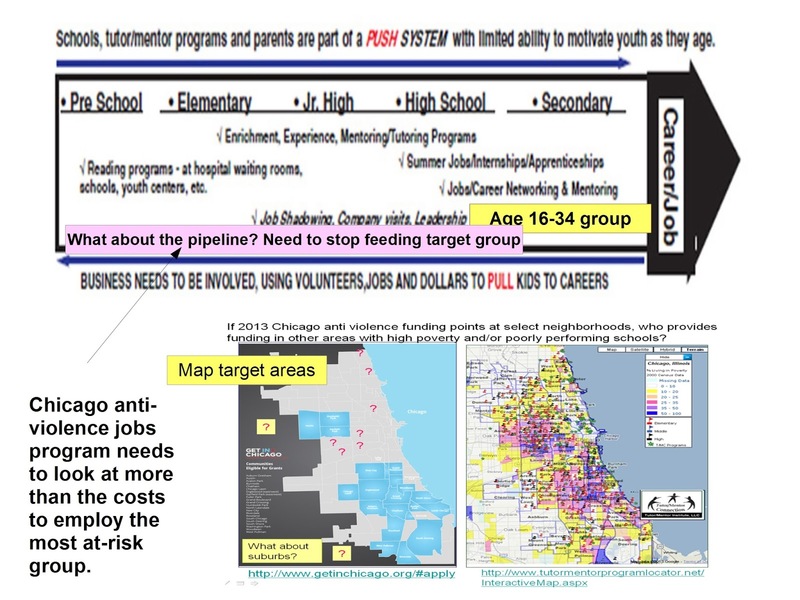 The graphic below is one I use to visualize the need for comprehensive youth development, tutoring and/or mentoring programs in all high poverty areas, which is where most of the shootings take place. So let me walk you through the way I create these map stories. 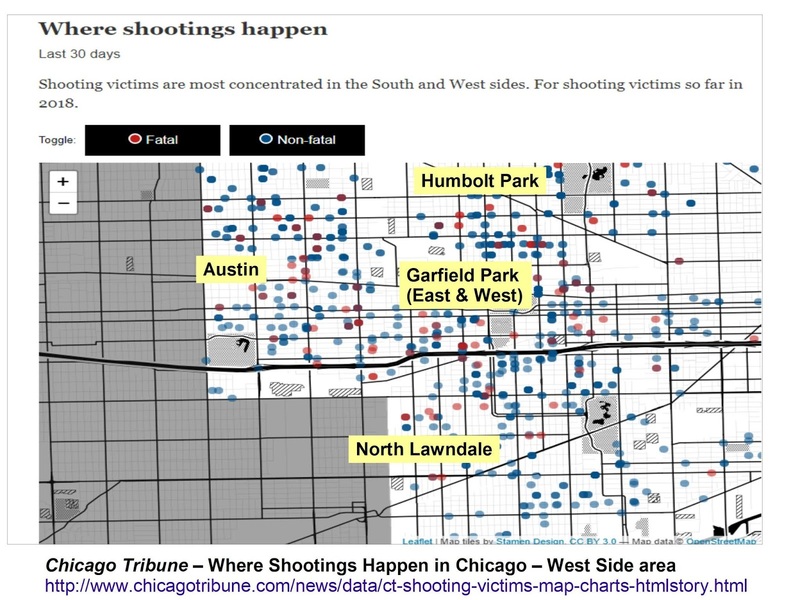 The first thing I did was zoom into the Tribune map, and enlarge the Chicago West side area where most of last night's shootings took place. 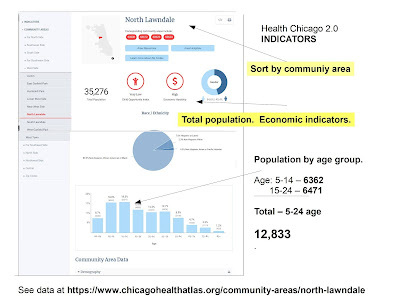 I copied this into Power Point and added the yellow labels to identify the community areas of Austin, North Lawndale, Humboldt Park, West and East Garfield Park. Then I saved it as a JPG so I could upload it into this article. Several weeks ago I posted a PDF with maps of different sections of the city, showing the number of high poverty youth, age 6-17 in each neighborhood. The West side of Chicago is shown in the map below. The yellow box shows data from 2011 and the blue box shows the same data, but from 2018. 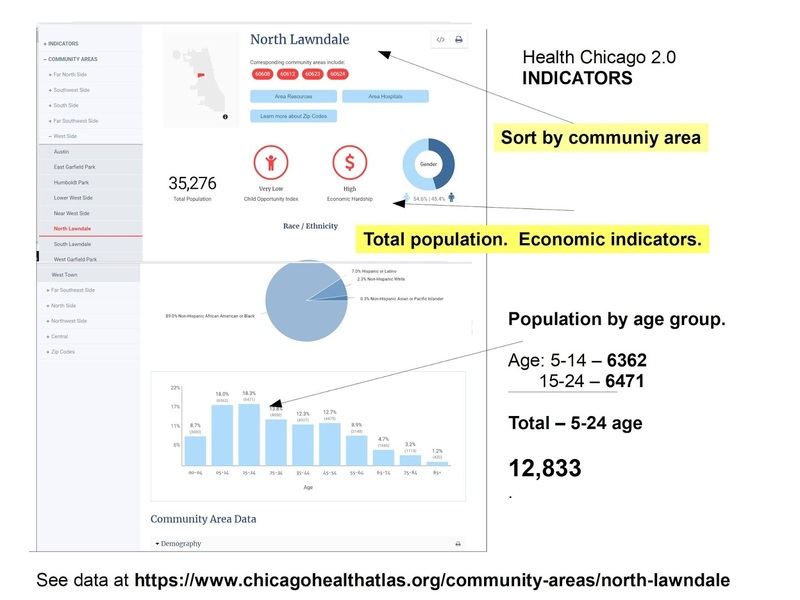 You can see that Austin and North Lawndale have a larger number of high poverty youth (more than 6000) than any of the other 77 Chicago community areas. I made this map using the Tutor/Mentor Program Locator, which as of 8/3/2018, no longer is connecting to Google maps. Thus, you're not able to use it to determine if there are any tutor/mentor programs in the area. 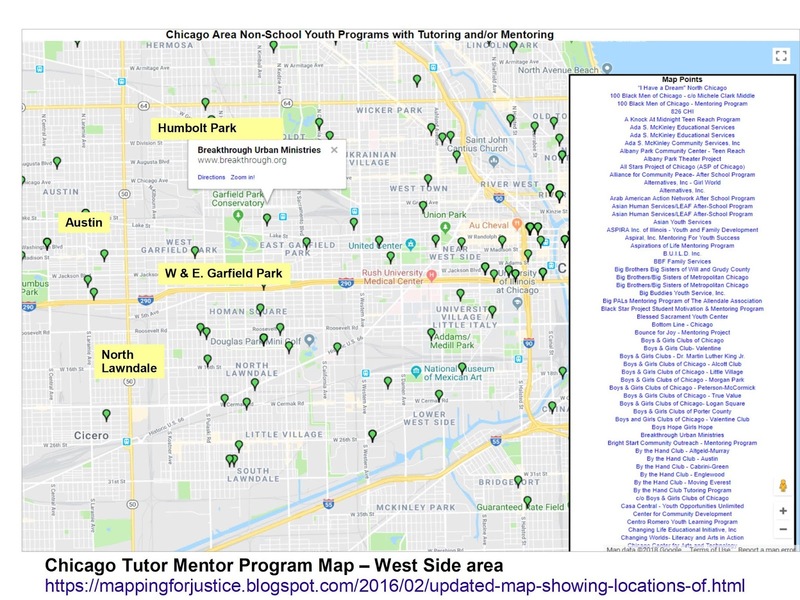 However, I started having problems updating the Program Locator in 2013, so in late 2015 I put my list of Chicago tutor and/or mentor programs on another map, which you can find here. I opened this link to the full map, then zoomed in to show the West side of Chicago. I put my mouse on one of the green icons, just to show how you can find the name and web site address of programs on the map. It's not as detailed as the Program Locator, but it works for this process. I copied the image into PowerPoint, added the yellow labels, then again, saved it as a jpg so I could put it in this article. 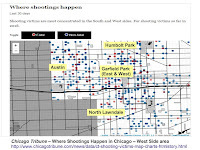 By doing this I'm showing where the shootings took place, indicators, such as poverty, that show why they took place, and whatever resources might already be in these neighborhoods trying to help kids stay safe and headed toward high school graduation and jobs. By doing this you know that there are youth serving organizations in these West side neighborhoods, but too few based on the large number of high poverty k-12 kids. If someone were collecting data on opportunity youth, age 16-25, it would show a need for even more programs. Furthermore, by looking at the location of program sites you can see that they are too far for many kids to attend. 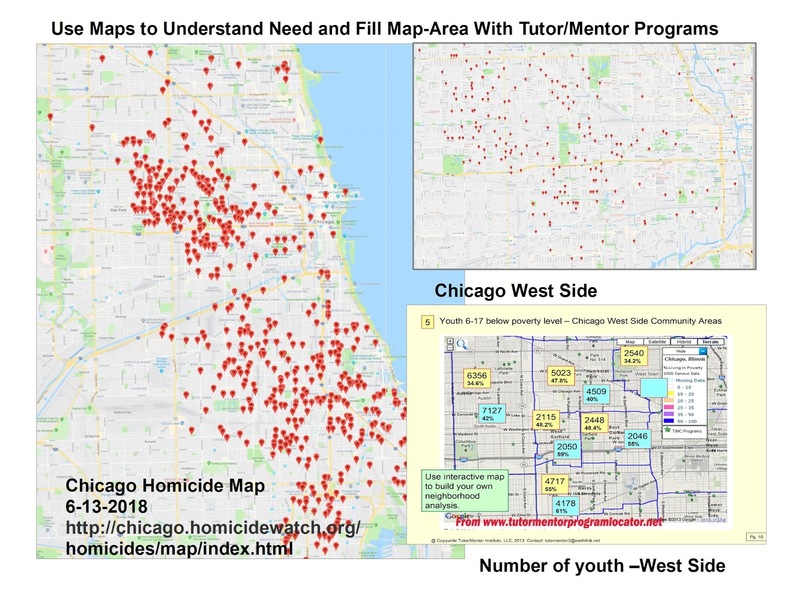 If gang territories were also shown on the maps, they might show it's also unsafe for kids to go from one part of a neighborhood to another to take part in a non-school program. Thus, more programs are needed in most areas. At the left is a concept map that I created many years ago to show the different supports kids need as they grow from from pre-school through when they are starting jobs and careers. These need to be available in every high poverty area. I've been trying to plot tutor/mentor programs, showing type of program and age group served (see search page), but I don't know anyone who is even trying to collect the data that would show what other assets are available on a neighborhood-by-neighborhood basis. If we're going to provide systems of on-going support to kids in every high poverty neighborhood, someone needs to be collecting information that shows what's already available. If someone were doing this, they could be putting links from each node on a concept map like mine, to web sites of those service providers. Then, if this information were available, it would be possible to lead year-round efforts to help existing programs get the resources they need to stay available and constantly improve, while also trying to bring new services to areas where more are needed. 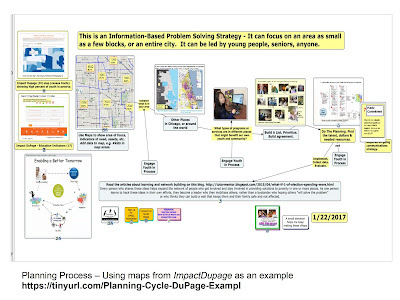 Since I already collect and share information about existing non-school programs, groups in any Chicago community area could be already creating map stories like this one and be sharing them on social and traditional media with a "get informed, get involved" daily call to involvement. One of the many challenges we face is that if you look at web sites of the youth organizations on my list, very few provide enough information for shoppers (parents, donors, volunteers, media, researchers, etc) to really know what their theory of change and long-term strategies are. Thus, while there are many green stars on my map, they don't all serve the same grade levels, or fill all of the steps on this "mentoring kids to careers" ladder. And it's almost impossible to differentiate between them. This Shoppers Guide pdf offers some ideas for what I think would be helpful on program web sites. It's only my suggestions. I encourage you to create your own version and share it with myself and others. However, until business partners, volunteers and donors provide the resources for programs to collect and communicate this information on their web sites, few will be able to do it. On my Facebook feed someone said "it will take the entire village" to help prevent these shootings. 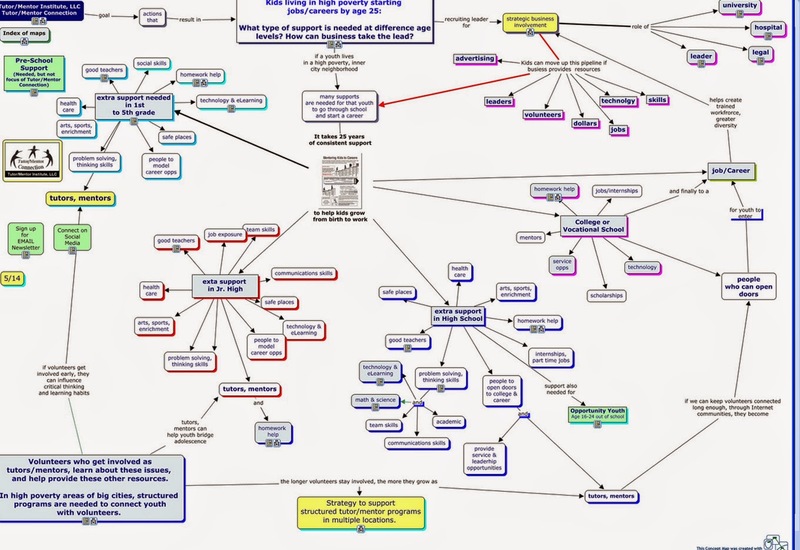 I've visualized what that means to me with this concept map. 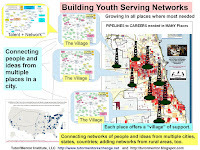 The village includes people from all sectors who each make a long-term commitment to use their time, talent, dollars, technology and jobs to help kids in every high poverty community area of Chicago (or other cities) have the full range of supports that I show on my graphics. Had leaders been doing this since the 1990s when I first started sharing these ideas maybe things would be different today. If they start applying these ideas today, maybe things will be different by 2025 and 2030. As much as we all might wish it, these changes will not take place in just a few months or years. I'm available to help groups understand this process and (for a small fee) will gladly help them learn to create and share map stories like I've been doing. Connect with me on Twitter, LinkedIN or Facebook. If you've read this article and value what I'm sharing, I could use your help. Visit this page and use the PayPal to send me a small contribution to help me keep doing this work. 100% of Seniors Graduate. What does this mean? I want to focus on two ideas in this article. First, over the past few of year’s I’ve seen statements from several different organizations saying “100% of my seniors graduated from high school”. Some added “and went to college”. With the emphasis on outcomes I can see how this would be a meaningful statement. But is it also a misleading statement? 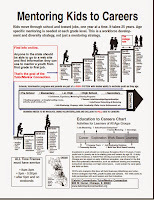 Here’s a chart I created several years ago showing the 20-25 year role of business, family, non profits, educators, etc. in helping youth move from birth to age 20-25 when they should be starting jobs and careers. When someone says “all my seniors graduated” they are not telling you at what age level those seniors were when they joined that mentoring or tutoring program. They are not telling the demographic background. They are not telling the academic history. Thus, you could imply that this organization that claims to serve several hundred young people has built a strategy that gets those young people involved at an early age, like middle school, and keeps 100% (ALL) of them involved through high school and they ALL graduate and they ALL go to college. If someone working with young people living in high poverty is telling you they accomplish this, I think they are leaving out some important information. There’s too much transition of families in poverty for all youth to be able to stay with a program located in one neighborhood for 4 to six years. There are too many diseases that affect youth in poverty, such as Asthma and Diabetes, or gang violence and/or teen pregnancy, and too many young people getting caught up in the juvenile justice system for programs to be able to keep 100% of youth enrolled for four to six consecutive years. And, if a program starts with youth in elementary school, this is even more of a challenge. I may be wrong. However, I don’t see attendance charts on many program web sites. I don’t see “theory of change” strategies with graphics like the one above that shows when a youth joins a program and what they do to help them through high school, then through college, vocational school and into jobs. I also don’t see information showing the demographics and academic background of young people when they join a program. 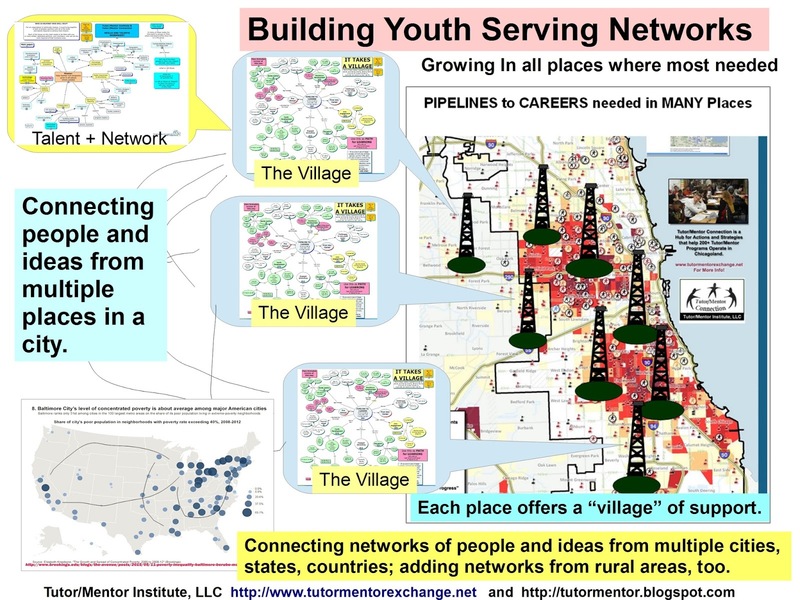 Using maps to demonstrate where youth in a program live is one way to show this. Providing an overview showing the percent of youth in a program living under the poverty line is another way. Showing what percent of youth in a program attend private schools would be another indicator that would differentiate the youth served by different programs in different places. That does not mean there are not lots of programs who do have these strategies and this information, but do not share this information on their web sites. Thus, when some leaders boast “100 percent of seniors graduate” we’re making assumptions about what these programs are really doing and what impact they are having. 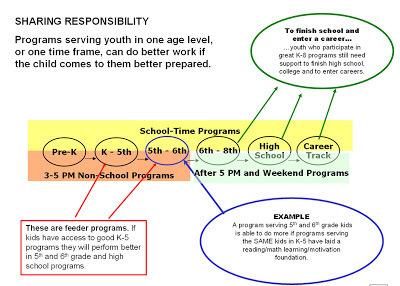 If you’re evaluating programs and/or choosing between different programs to make funding decisions, it makes a huge difference in the work required if a program starts working with teens when they are juniors or seniors in high school vs if they start working with youth when they are between 7th and 9th grade, or in elementary school. It makes a huge difference in the services a program needs to provide if a program has recruited youth who already have great academic credentials or potential and/or are already attending private high schools vs serving youth who have not yet navigated the difficult transition from adolescence to high school. Here's the second idea. 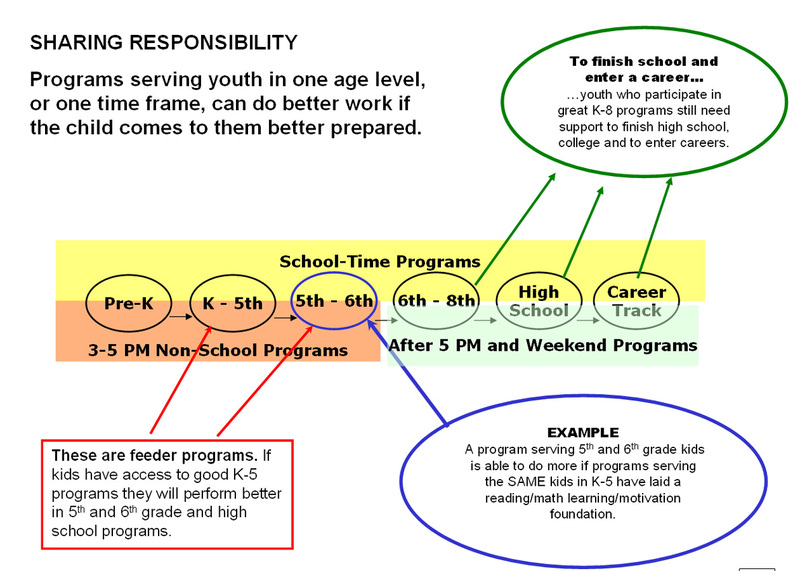 The graphic I used at the top of the page shows systems of support that reach kids early and stay with them through high school and beyond. This support should be available during the school day, right after school and in the hours after 5pm when workplace volunteers are more consistently available. 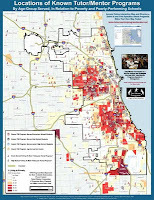 These systems of support need to reach kids in every high poverty area of Chicagoland and other urban areas. I've tried to collect information about existing non-school tutor/mentor programs and plot this on maps since 1993. Browse map stories posted on http://mappingforjustice.blogspot.com between 2008 and 2011 and find examples of this work. I've not had funds to update my map platform since 2013 and as of today, it's no longer connecting to Google maps. Unless I find a developer who will donate time and talent to help fix this, I'll need to close that site. So far, I've also not found anyone else in Chicago or around the country attempting to use maps the ways I've piloted. 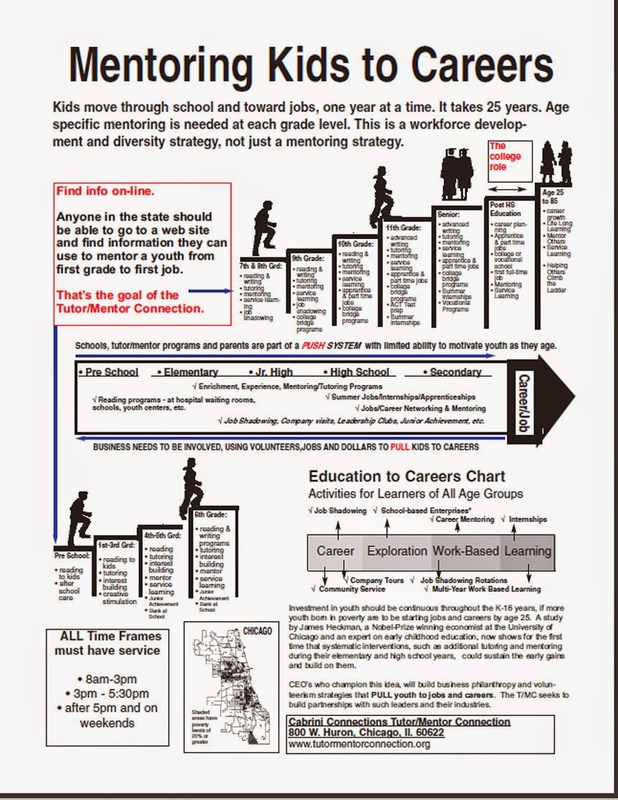 I encourage you to apply graphics like the one at the top of this article (see more here) to show what age range youth are when they join the program, and what retention they have from year to year, as well as what number then graduate and enter college as a result of the support a program and its volunteers provide. 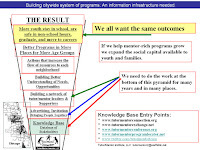 If you’re a business, college, or local media, you can help by asking for this information, and by offering your time and talent to help programs create graphics, theory of change documents, and measurement tools that they can use to track year to year participation and retention for their own process improvement evaluations, and for building a more uniform way that all programs demonstrate what they are accomplishing and who they are serving. This is also something that can be discussed in online forums such as the ones I host at http://tutormentorconnection.ning.com and on Twitter, Linked in and Facebook. If others are hosting such discussions please post links to them so others can find you and participate. With poverty maps, it's easy to see where some kids need help. Not so easy with others. I've been using maps since 1993 to show where kids need extra help provided by non-school tutor/mentor programs, based on indicators like high poverty, poorly performing schools, and/or incidents of violence. You can skim through many articles on this blog and see how I've done that. You also can look at the articles at the MappingforJustice blog, or on the Tutor/Mentor Institute, LLC site, and see more examples. Based on the information I've been able to collect, there are too few programs in many parts of Chicago and some of the programs that do exist need a lot of help on an on-going basis to be considered "world class" in what they do. However, there are many youth who do not live in high poverty areas who also need extra help. I saw a version of the graphic below on Kevin Hodgson's Twitter feed this week. I created my own version, putting an "x" on one of the flowers. Can you find it? My point is that kids who may be struggling with many personal and family issues blend in with other kids in their public and private schools. This problem affects kids of all income levels and all race groups. The kids could be from broken families or from families where one, or both, parents are in the military and deployed overseas. They are kids who might be bullied. 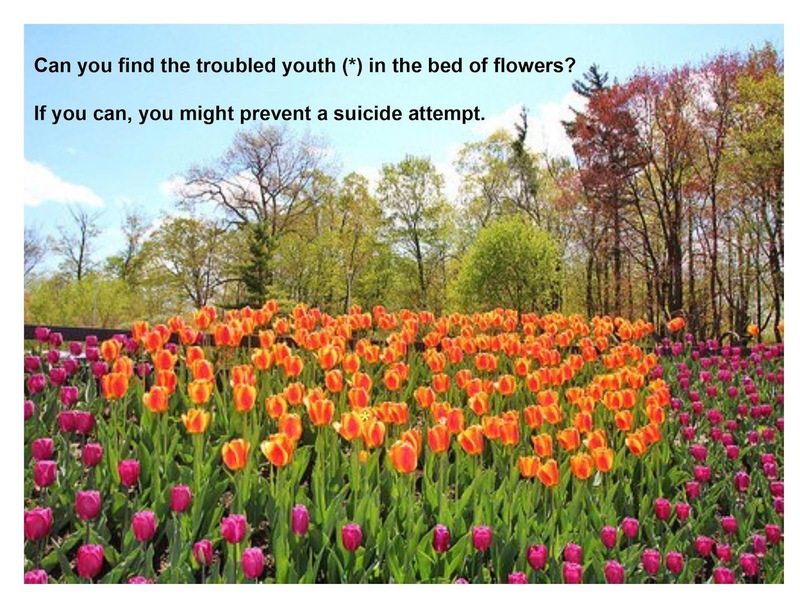 Or who could be struggling with depression, and at risk of suicide. My maps make it easy to focus on geographic areas where indicators show that extra help is needed. There are no maps that show who these other kids are. These kids need our attention and help, too.